Sir Paul McCartney was born 38 years, to the day, before I was. In 2018, I found myself singing "Hey Jude" to lull my infant daughter on her first night in this world. Everyone has their own relationship with the Beatles; their music is one of the few remaining things on this planet that is at the same time inviolable, deeply personal and completely universal. 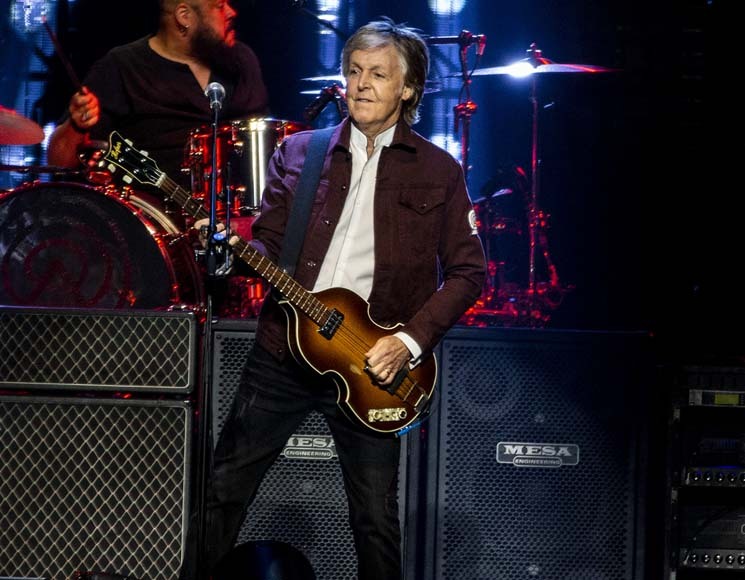 You could almost see the memory synapses light up all at the same time in the minds of the multi-generational crowd as McCartney opened the last Canadian date on his "Freshen Up" tour with "A Hard Day's Night." A mix of Wings, Beatles and new songs from Egypt Station followed, signalling that the evening would be spent time travelling across McCartney's entire catalogue. His band played the older songs as if they'd just discovered them while the newer tracks were played with as though they'd invented them. The most welcomed songs of the night by far were the Beatles tracks that formed the soundtrack to the latter half of the 20th century. It wasn't only McCartney compositions that were featured. "Being For the Benefit of Mr. Kite!" brought a Lennon-penned psychedelic circus to the arena, and "Something" began by McCartney playing a ukulele and signing alone in a touching tribute to George Harrison. Short stories about his former bandmates, as well as other legendary musicians he'd encountered, were interspersed throughout the long and winding night. There were also some genuinely funny moments, like when a bald, burly security guard was visibly moved during "Love Me Do" and became inspired to give out little love heart candies with the written messages on them to other security staff. The composition of the soldout crowd was rare for a concert in Edmonton. When McCartney elicited applause from local Edmontonians, then broadening the scope to those from Alberta, and then finally everywhere else, it was difficult to tell what group was the loudest. He followed with a goofy joke about being a member of the tourism board, but the unspoken subtext was that his personal gravity hasn't waned through 60 years in the public eye. He was uniquely able to draw a crowd from all ages in all corners of the globe and gather them in the same Northern Canadian arena at the same time. McCartney gained energy from the pleased crowd as the night went on, hitting his stride in hour one, gaining momentum through hour two and by hour three, hitting peak performance during "Live and Let Die," while loud pyrotechnics and indoor fireworks caught everyone off guard. His voice may not have been as fresh as it was in 1964, but it was far from its expiry date, with a well-earned scratchiness that added legitimacy to his legendary melodies. Who else could hit the high "wooo!" in "I Saw Her Standing There" during an encore after almost three hours of straight playing at age 76? Perhaps the better question is who would even try, let alone play three additional songs after doing so? Being overly critical of Paul McCartney would be like being overly critical of Mozart. If you went to see the show it was either because you've had Beatles songs rattling around in your brain since you heard your parents (or grandparents) play them. Or perhaps you are of a certain vintage and able to remember when they'd arrived and the buzz of that moment has never completely worn off. It's impossible not to have some sort of profound memory associated with the music Sir Paul McCartney brought into the world as a solo artist and as a Beatle. Devoted effort would need to be invested to forget the three-plus-hour performance.